Bethany made these for dinner on Sunday night. They’re one of my favorites. There are many variations on the ‘net out there. I’d use Miracle Whip instead of mayo if I was doing it, but there’s not enough to taste the difference. We also generally add a 2nd can of cream of chicken soup so there’s more (& thicker) gravy. We have used the light Miracle Whip and the “healthy request” can of chicken soup with no discernible difference. Obviously, a rotisserie chicken makes this go a little more quickly. Ha ha. Also, I like to grill the chicken breasts on the counter-top electric grill rather than boil them. Seems easier, and I like the dark edges. This is one of my favorie meals, it lasts for lunches for days or freezes well. I like ’em with a side of nice fresh green beans. 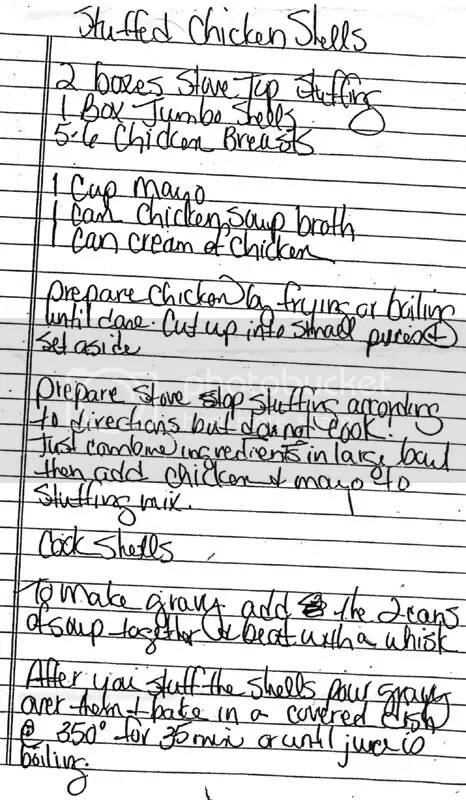 Also… you could change it up with Cream of Mushroom or Cream of Celery or Cream of whatever soup… Not sure how you’d adapt to a vegetarian/vegan version if you wanted to… I know Campbell’s “cream of” soups have “natural flavors” that could have once been alive & self-aware… and I’m not sure about stove-top stuffing but I’m sure there’s chicken flavoring in there. We’ve also done this with leftover Turkey & stuffing after Thanksgiving. “One cannot think well, love well, sleep well, if one has not dined well.”: Make this dish! This is super fast and easy, plus it is damn tasty. The base of this recipe is taken from the Joy of Cooking, which you should really consider buying if you don’t already own a copy. The other night, the wife & I were in the mood for pizza, but not for any of the plethora of local pizza places. We decided to make our own. We were going to get one of those pre-made Boboli crusts, but while at the grocery store my wife came across one of those cardboard tubes of pizza dough by Pillsbury. We decided why not try that? I like a puffy doughy not quite fully cooked crust. Well, this wasn’t that… but it was tasty. It seemed to be pretty thin, but it was flavorful. We bought the Giant Eagle brand jar o’ pizza sauce because it was way cheaper than the real brands. I added some brown sugar ’cause I like sweet sauce… but I’m getting ahead of myself. My wife spread out the dough and I brushed on some extra virgin olive oil and sprinkled on some garlic powder. Then we put down the sauce & brown sugar mixture, and a 2-cup bag of “4-cheese Italian” shredded cheese. We put diced green peppers, turkey pepperoni, and canned mushrooms on the whole thing… and I put diced Canadian bacon & chopped olives on my half. I topped it off with a little leftover taco cheese, and put some crushed red pepper flakes on my side. We baked it according to the instructions on the weird cardboard roll, and it turned out great. We need to do homemade pizza night more often! I think we’ll skip the EVOO step though… I don’t think it was all that necessary.